KUALA LUMPUR: Penang-based ViTrox Corp Bhd has pushed back its ‘555’ target to attain RM500 million in revenue with 500 staff in 2015 by another two to three years, said its chief executive officer and president Chu Jenn Weng (pic). By then, the technology company’s market capitalisation should exceed RM1 billion from RM607.44 million currently. “We believe that in another two to three years (from 2015), our revenue can hit RM500 million, out of which 30% will come from merger and acquisition (M&A) activities and the remaining 70% from organic growth,” he told told The Edge Financial Daily after the 2014 Investor Day of icapital.biz Bhd recently. “With the increasing volume of semiconductor components as well as the rollout of 4G and 5G networks, we will continue our strategies on market expansion, M&A activities, research and development (R&D), and go into more diversified markets to increase our market share,” he said. ViTrox, which employs about 300 staff, also expects to increase its workforce to 500 by 2017 or 2018. Nevertheless, Chu, who is also co-founder and substantial shareholder of ViTrox with a 29.77% stake, said the group is maintaining its long-term target of achieving RM900 million in revenue by 2020, and for its market cap to hit as high as RM2 billion based on a price-to-earnings ratio of 10 times. At an average profit margin of 25%, he said ViTrox should generate net profit of more than RM200 million by 2020 on revenue of RM900 million. Still, ViTrox’s ‘555’ target looks a long way off. For the financial year ended Dec 31, 2013 (FY13), ViTrox saw its net profit grow 20% to RM24 million from RM20 million a year ago. Revenue rose 19% to RM106 million compared with RM89 million. Worth noting is that for the first half ended June 30, 2014 (1HFY14), ViTrox’s net profit jumped 243% to RM24 million from RM7 million a year ago, matching its full-year net profit in FY13. Revenue also doubled to RM88 million from RM41 million. For FY14, Chu is confident that ViTrox’s net profit and revenue will increase by 30% to 50%. “We still have a few more months to go [in FY14] and I don’t want to be over-optimistic. [But] I don’t think we can repeat the triple-digit growth for the full year [like we did in 1HFY14],” he said. For ViTrox, the first half is traditionally slower than the second half. “[However], we did an extremely good job in 1HFY14, thanks to the recovery of the semiconductor sector as well as the booming smartphone market. So, I don’t think the second-half will be much stronger than the first half. It (2HFY14 growth) will be moderate,” said Chu. In view of the positive industry prospect, ViTrox is now aiming for another round of double-digit growth of revenue and profit in FY15. “We are very positive about the business outlook. We will continue to grow as long as we execute our strategies right,” said Chu. ViTrox shares closed 4.4% higher at RM2.61 on Friday. Year-to-date, its share price has risen 113.59%. 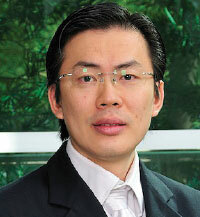 “I think our share price is reasonable and still has upside potential,” said Chu. Vitrox was recently picked by The Edge Research under the column of “stocks with likelihood of corporate exercise”. According to The Edge Research’s report, which was published in The Edge Financial Daily last Tuesday, Vitrox has jumped on board with an app that is able to determine the user’s heart rate and temperature using a smartphone camera. The Edge Research said though the stock valuations appear to be slightly on the high side, return on equity is also high at 32.9%, as Vitrox’s earnings are growing rapidly. Meanwhile, Chu said the group is considering various options to raise fresh capital from public investors as well as seeking bank loans. “With the Campus 2.0 expansion and M&A activities, we might need to raise RM100 million to RM200 million [to be utilised] in the next three years. “It could be a combination of bank borrowings, issuing new shares or private placement. But we have not decided which option yet,” he said. ViTrox is acquiring land for its new facility, which will be known as the Vitrox Campus 2.0, at Batu Kawan on the mainland side of Penang. Campus 2.0, which will also house a reserach and development centre, is expected to break ground by 2015 and be completed by 2016. On M&A, Chu said ViTrox is looking at acquiring technology companies dealing with software or hardware, which can add value and synergise with the group’s existing business. “We don’t limit ourselves to just local or foreign companies... as long as they can help us to increase our market share,” he said. ViTrox is the country’s largest solution provider of automated machine vision inspection systems and equipment. Its products are used by companies in the semiconductor, automotive, telecommunication and electronic packaging industries to detect defects that occur during the manufacturing process.